E-Discovery is the next big thing for lawyers. In the past, when lawyers shared files, there would be reams of paper in boxes full of folders. Fast forward to today, paper and folders are going digital. So, what do lawyers do with their paper documents? Well, a lot of the time they just scan them. Here’s the problem though: those scanned documents have text, but to a computer they are ‘pictures’ of text. So you can’t use them the same way you could a regular Word file. Optical Character Recognition (OCR) is a software tool that converts scanned documents into text files that a computer can process. So, instead of just being ‘pictures’ that sit on your computer, you can actually work with them. After you run OCR on the document you can . .
Quickly find names, dates, and keywords in the documents. Very useful in the processing, review, and analysis stages of e-discovery; when you’re handling thousands of documents. Easily edit and redact the documents, including copy/pasting into and out of them. With OCR all this is really not much extra effort. Without OCR, you’d need to get the text of each each document re-typed manually, and there would likely be mistakes in the process. How do you use OCR? As great as OCR is, it’s often not that easy to use. Usually, you need to . . . Contact a vendor and get a quote. These are charged per page. Wait until the process is complete – usually a few days to a week. Upload the content to some search system. GoldFynch is an e-discovery platform that is powerful, affordable, and easy to use. And it has OCR built into it. 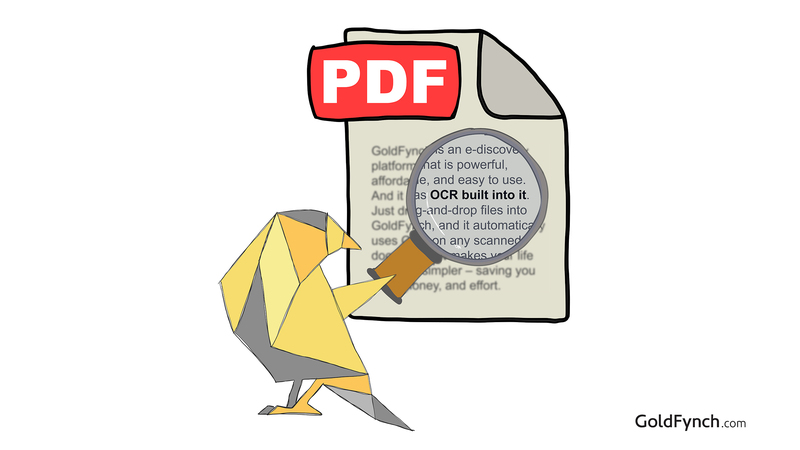 Just drag-and-drop files into GoldFynch, and it automatically uses OCR on any scanned documents. It makes your life so much simpler – saving you time, money, and effort. To find out more visit GoldFynch.com.